When I deliver professional development activities with teachers, I often need to point them to easy and effective online tools for working with media. Typically, they need to learn how to optimise images for the web (eg cropping and sizing), do some simple tweaks to correct exposure problems, or add some simple labels to images. Most don’t have the budget or inclination to commit to ‘proper’ image editing software such as Photoshop or Gimp. Picnik has been a favourite since even those with limited skills and confidence find it an easy way to get started on working with images for the web. And since it is an online tool accessed with a browser, no installation is necessary. It was well-deserved recognition when Picnik was acquired and incorporated into Google+. Unfortunately Picnik has now announced it is closing its stand-alone site on 19 April 2012, so those without a Google+ account will be out of luck. The good news is that in the last day or so, PicMonkey has become available. PicMonkey has a very similar interface and feature set to Picnik (see the screenshot) so those familiar with Picnik will find it easy to use. 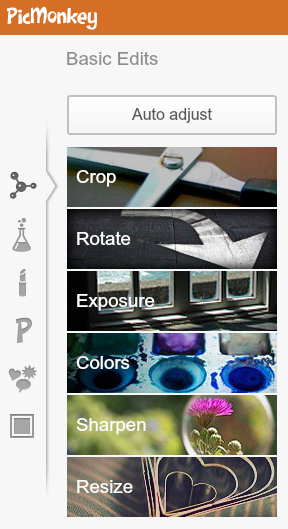 Like Picnik, PicMonkey has a set of free features and some which require registration for a premium account. The really good news is that PicMonkey seems at first glance to be better than Picnik – it’s significantly faster to load and apply edits. From now on, I’ll be pointing teachers to PicMonkey as a fast and simple tool for editing and optimising images for the web. This entry was posted in Tools and tagged edit, image, online, optimise, picmonkey, picnik on March 11, 2012 by Paul Left. Teachers and students often need a fast and easy way to create a simple website to share text and photos. A full-featured blog can seem too complex or unwieldy for some situations. 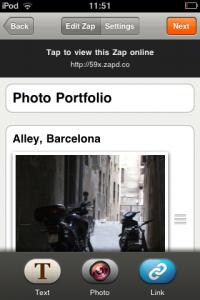 Zapd is an app for iPhone, iPod touch or iPad which has a limited set of features but which makes it really easy and fast to create a good looking site. Once you’ve download the app and set up your profile, you can quickly create a new site using one of the supplied themes. The themes are generally clean and clear and can be changed at any time. Then it’s just a matter of adding content – note from the screen shot that there are only 3 content types available: text, photo or link. Content items are normally added to the bottom or top of the page, but you can drag the items to re-order them. Each site created in Zapd has a unique and short URL – my test site is located at http://59x.zapd.co. It took me about 10 minutes to make my simple online portfolio of photographs – that is, about 1 minute to add the photos and text, and the rest of the time playing with the themes :-) Fun. Why use Zapd? I do like the flexibility and much greater feature set of Tumblr, but I would recommend Zapd to any teachers who want an entry-level tool for creating simple sites. It lowers the barriers to creating online content for both teachers and students. 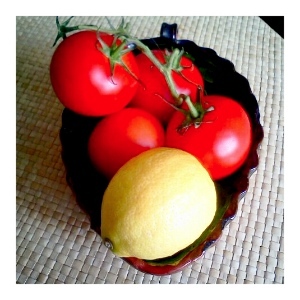 This entry was posted in Tools and tagged online, photo, publish, student, teacher, website, zapd on June 11, 2011 by Paul Left. Unitec’s Diana Ayling (pictured) spoke at an Elearning Community workshop about an online community she’s involved with which focuses on teaching and learning. These are my brief reflections on her presentation. Teachers take time to develop a voice online because creating and managing content is a complex skill set. There is a growing need for teachers to develop ‘real-world’ technology skills such as working with social network technology. We need to ‘go to where the learners are’ so need to move beyond the institutional Learning Management System. Teachers have varying levels of resilience – when something goes wrong such as a technical problem, some are inclined to give up straight away while others see it as only a temporary setback. There is a tendency to form splinter groups, as some are more comfortable with interacting a small group. This may have the effect of decreasing overall activity and interaction. Data protection and copyright are ongoing issues as teachers move to more open technologies such as social network tools. Online safety and privacy is an issue for both teachers and learners. Separating the personal and professional online presence is complicated but necessary. When working with teachers as community members, we should not make assumptions about their level of technical skills – patronising them is a real turn-off. Finding time to contribute actively to multiple communities and online spaces is difficult for busy teachers. RSS is a great tool for managing all the sources you read, but it doesn’t really help with contributing through writing. This entry was posted in Learning communities and tagged challenges, community, learning, online, teaching on February 28, 2011 by Paul Left. Clark, RC, Mayer RE (2003). E-learning and the Science of Instruction. Wiley & Sons. Garrison, D., & Anderson, T. (2002). E-Learning in the 21st Century: A Framework for Research and Practice. Routledge Falmer. McKeachie, W. J. (2002). McKeachie’s Teaching Tips: Strategies, Research, and Theory for College and University Teachers. Houghton Mifflin Co.
McPherson, M., & Nunes, M. B. (2004). Developing Innovation in Online Learning: An Action Research Framework (Open & Flexible Learning S.). Routledge Falmer. Palloff, R. M. (2003). The Virtual Student: A Guide to Understanding and Working with Online Learners. Jossey Bass Wiley. Palloff, R. M., & Pratt, K. (2004). Collaborating Online: Learning Together in Community. Jossey Bass Wiley. This entry was posted in Learning communities and tagged article, bibliography, book, Communities, learning, list, online, reference on February 17, 2011 by Paul Left.